Create an App ID and App Key. Click on your email address in the top right and navigate to Administration and click on “ONTRAPORT API INSTRUCTIONS AND KEY MANAGER”. You need to use a key that has “Add Contacts” permission. If you do not have a key, click “Create New API Key”. Name the Key, choose a Key Owner, and check the box for the “Add Contacts” permission, then click “Save”. Once the Key is saved, locate the App ID and App Key on the Keys Listing page. Copy them for use in the Promotion Integration configuration. 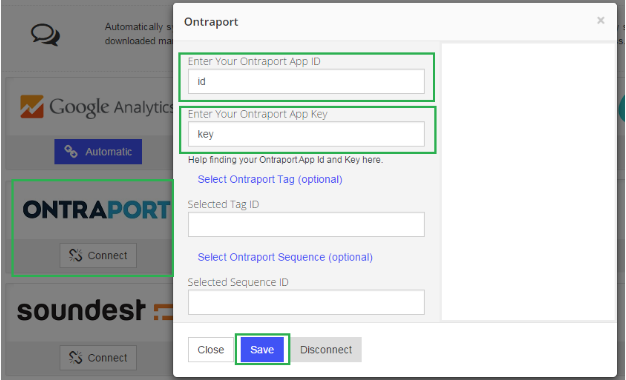 On the "App Integration" tab, locate and click on the Ontraport "Connect" button to launch the configuration options. Enter your App ID and App Key from Step 3 above and click “Save”. Optionally, you can select a Tag and/or Sequence for all contacts. Your Justuno contacts will now be added to your selected Customer List in Ontraport!